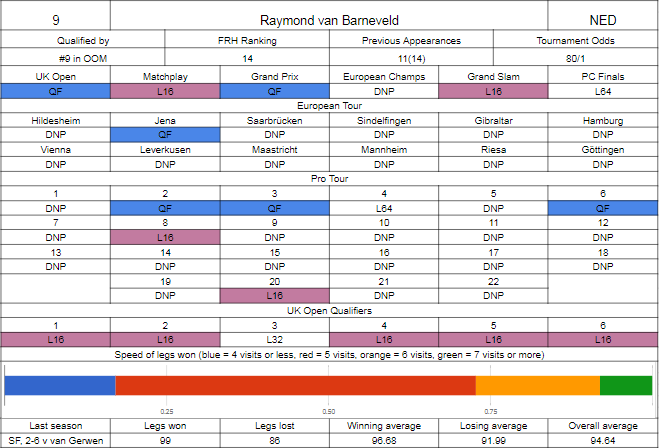 So around this time last season, Barney said he was going to play the tour properly, and a lot of us were thinking "yeah, of course", but to be fair, he was, at least for a while - playing every UK Open qualifier with very consistent results, although he could have taken some further given he went out to Dolan, Kist and Painter in three of them, made the quarters of the main event, losing out in a tight game to eventual champion Peter Wright, then played the first eight Pro Tour events and some of the European qualifiers, reaching four quarter finals. Then April arrived and he just finished off the Premier League and went on the exbo series around the world instead, not playing another ranked event all year except for the majors and two warm up Pro Tour events prior to the Grand Prix. Oh well, at least you tried. Seeded in the same segment of the Matchplay as Taylor meant he couldn't get far, and didn't have it all his own way against Cullen, he would go one round further in Dublin, but with the draw having opened up he surprisingly fell at the quarter final stage to John Henderson. He obviously didn't qualify for Hasselt, but won his Grand Slam group landing him the runner up in the Michael van Gerwen/Rob Cross group and that was that. His early Pro Tour work got him to Minehead, but his low seeding gave him Ian White in the first round, a winnable game but he couldn't nick the deciding leg missing two match darts with White waiting on double. His figures are very good from what data we do have, so he clearly still has it. North's a surprise package who won his tour card this January at the fourth attempt, getting it outright on day 2 beating Hine, Alcinas and Bain to claim it, and had a flying start, claiming three grand in the UK Open qualifiers including a last 16 run, which wasn't quite enough to make round 3 (and the money) outright and he lost to Ronnie Baxter in round 2. He would grow on people's radars more in April with two quarter finals on the Pro Tour in one weekend, he'd also tack on a few European qualifications, playing four in total, two just before the Matchplay and a couple in September while not really impressing in any of them, but having added on a few more board finals and a couple of board wins on the floor, he'd make a big break through in August, reaching the final of the 18th Pro Tour event, nearly nicking it outright but losing a deciding leg in the final to Dave Chisnall, but it was possibly a bit fortunate - the highest ranked player he faced prior to that was Joe Cullen, but you can only beat what's in front of you I guess. This gave him enough to qualify for the Grand Prix despite not quite having a full year of tour records, and was due to play Gary Anderson, but after he withdrew he was able to get past Mark Webster on short notice, before not getting a set against Whitlock in round two. North's last run out was brief, in Minehead he got past Pete Hudson but then fell to Adrian Lewis. Barney should have way too much here. North's still getting used to the stage, sure, but he'll need to improve a lot to come close and translate his floor game much better. Over 30 won legs is a decent enough sample and he's not managed a twelve darter yet, and more than half of those took more than five visits to win. Barney won't allow that often enough. 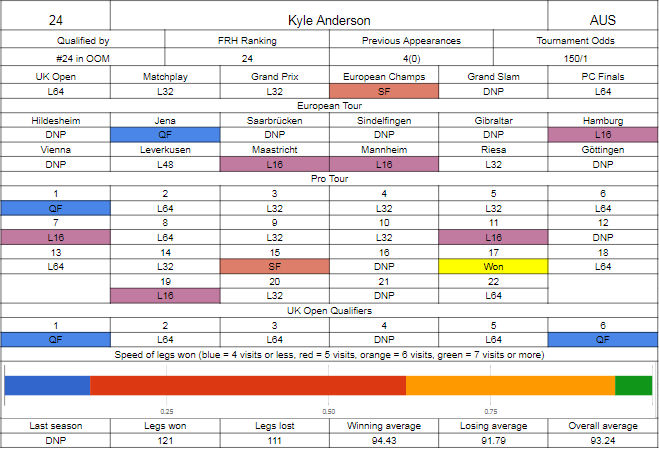 A big break through year for Kyle Anderson after last season finished in awful circumstances, with visa problems ruling him out of both the worlds and the Players Championship finals. Able to sort it out, he's had three big highlights - he's had his first ranking win in August, claiming it with wins over Tony Newell, Nathan Aspinall, Ryan Meikle, Ronny Huybrechts, Stephen Bunting, Michael Smith and Kevin Painter, hitting a nine dart finish along the way. He also claimed a TV title winning the unranked Auckland Masters a week later, beating Corey Cadby in a deciding leg, and he then came very close to a first proper major final, reaching the semis of the European Championship. He should have gone further - against van Gerwen in a deciding leg, he needed 80 for the match and pinned treble 20 first dart, but couldn't convert either of the next two and Michael stepped in and cleaned 76 out in two darts. What else for him? Making the UK Open was comfortable, but he'll be disappointed to go out to Jermaine Wattimena, had three further first round exits in TV events to Whitlock, van Barneveld and Meulenkamp, but the floor game was solid, making four Sundays in Europe, peaking at a quarter final in Jena including a big win over Mensur Suljovic, and outside of the aforementioned floor win, he won his board on five occasions, pushing on to a quarter and a semi once a piece. 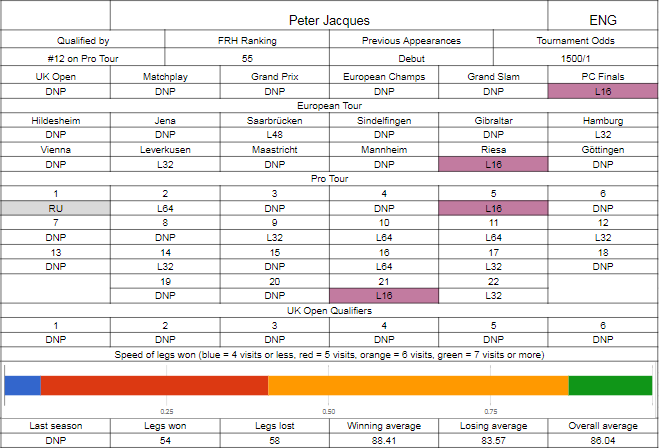 Jacques is a complete wildcard - he played the first three days of Q-School, looking in a good position to get a card having made the last 128, last 16 and last 64 to accumulate good countback points, but the story goes he didn't play day 4 as he had a county game that clashed with it. Oh well. Said points did allow him to get in as a PDPA alternate in quite a few Pro Tour events, and he goes and reaches the final of the first one. OK then. 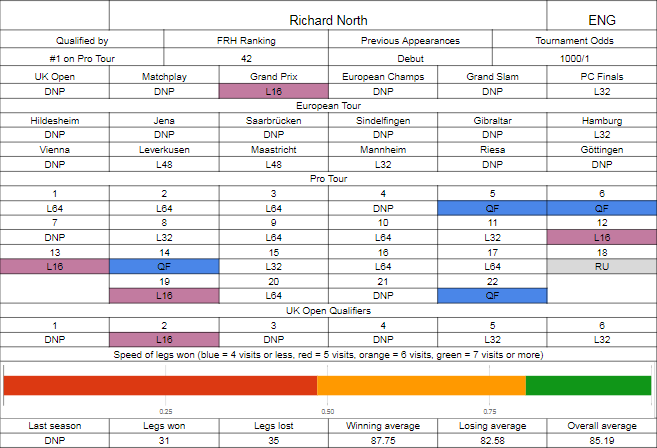 Nicholson, Payne, O'Connor, Gary Anderson, Michael Smith and Wade would fall before Norris had far too much in the final, but this gave him an opportunity to build on the tour. He wouldn't reach those heights again, only winning a board twice more, but it gave him enough in the bank to play every event, and kept chipping away, 500 quid here, a grand there, and along with making the European Tour four times, with a best result in Riesa of the last 16, losing to Jelle Klaasen where he had some chances (at least if I remember rightly, I was drinking a lot at the event) to go further, he's able to claim a Pro Tour ranking spot for here to make a worlds debut which I don't think he'd have seen coming twelve months ago. He did make one major, the Pro Tour solidity getting him to Minehead last month, where he gained some useful stage experience and held his nerve well with last leg wins over Cristo Reyes and Steve Hine (who'd just eliminated Peter Wright) before Jan Dekker had a bit too much class in the last sixteen. This should be a similar story to the other game in this section, Anderson should have too much. He just finishes legs in too orderly a fashion for Jacques to be able to generate too many break chances. He's going to have to rely on Kyle to take a leg or two off at critical times and stay very tidy on his own throw - unlike North he has at least hit some twelve darters in my sample, so I guess if he can find one of those on the Anderson throw and maybe nick a set, the upset could at least come into the equation.